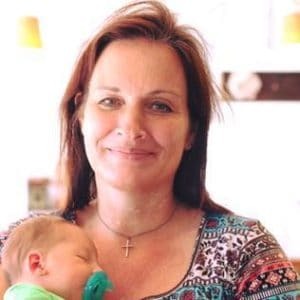 October 6, 2018 2 comments on "Instant Pot Oatmeal"
I received an instant pot for Christmas last year, and I have been enjoying trying out new instant pot recipes. I am going through recipes one by one, to see which ones are worth making again. This instant pot oatmeal definitely is easy to make and turned out great too. This recipe is a definite keeper! This recipe is for maple and brown sugar instant pot oatmeal. If you don’t want maple flavored oatmeal, just leave out the maple syrup and add a handful of diced apples or just leave plain. 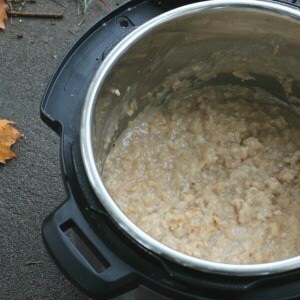 Oatmeal will definitely stick to your instant pot, making your instant pot difficult to clean, so grease the bottom of the pot with a little butter to help keep the oatmeal from sticking. Add all the ingredients to the instant pot and stir. Place the lid on the instant pot and lock it in place. Cook oatmeal on high pressure for 20 minutes. When the instant pot has turned itself off, remove the steam nozzle to quickly release the pressure. Stir, and serve with additional brown sugar. Note: This oatmeal refrigerates and also freezes well if you want to make a large quantity and save some for later. 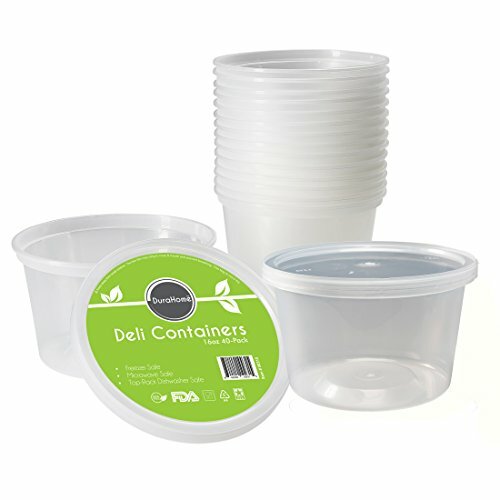 Here are my favorite inexpensive freezer containers I use for recipes like this. I have doubled this oatmeal recipe and cooked it for the same amount of time and it turned out great. If you are wondering if cooking oatmeal in the instant pot really does save time, I am going to have to say no. 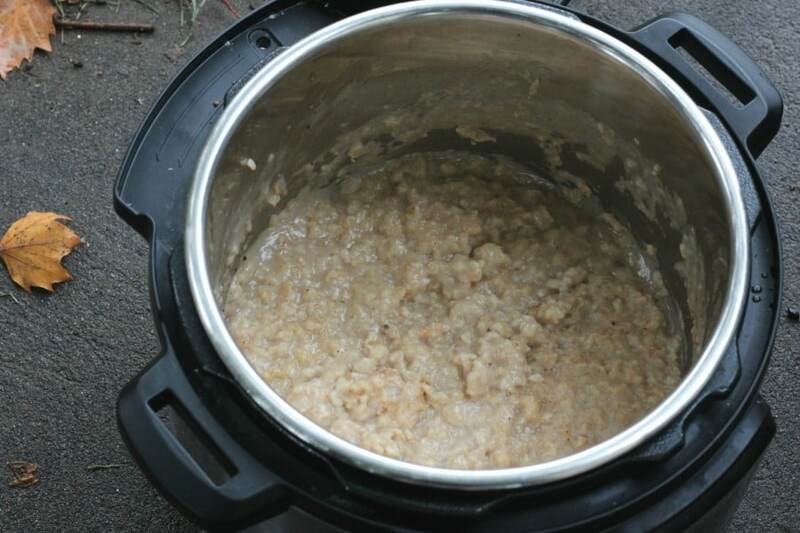 Besides the 20 minutes it took the oatmeal to cook, it took 10-15 minutes for the instant pot to build up the required pressure to cook the oatmeal. It is definitely faster to cook old-fashioned oatmeal on the stove top. However, if you want to set your instant pot to cook during the night and have your oatmeal ready for you in the morning, then this recipe will definitely accomplish that for you. 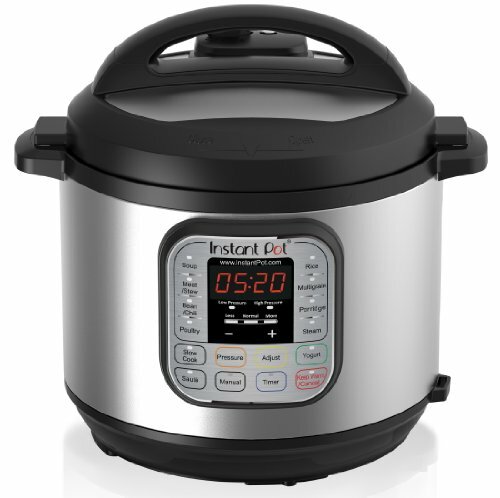 You can program your instant pot to turn on and cook whatever time you want. Definitely one of the perks of owning an instant pot! Like this recipe? You might also like this recipe for crock pot oatmeal. 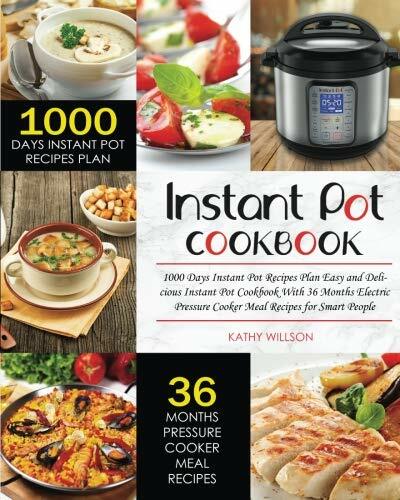 Follow my instant pot recipe board on Pinterest. 2 Comments on "Instant Pot Oatmeal"
your post said that is soon as the oatmeal is done cooking you should remove the steam nozzle to quickly release the pressure. I do not know how to remove the steam now so I only know how to move it from sealing to venting, but in another part of your post you said this recipe is not necessarily time saving unless you set it to cook overnight. My question is, if you cook it overnight the steam will not be a quick release but rather a slow release, how old is affect the outcome? That’s a good question! I don’t think it will affect the oatmeal (although I haven’t tried it). It will take it longer for the pressure to release, but I don’t think that will make any difference as far as the oatmeal is concerned.